When we last visited Vehicle Town, we had subclassed the Truck class, so our trucks could do more specific tasks. But in Vehicle town people are scared, there have been reports of strange vehicles and trucks roaming the streets. The mayor wants us to look into this and see whats going on. We can create instances of Vehicle and Truck which makes no sense. What would these objects look like? They're just abstractions. We can use the abstract keyword on the class so these objects cannot be instantiated but can still be extended. Press the button below to cycle through our Vehicle Town problem. 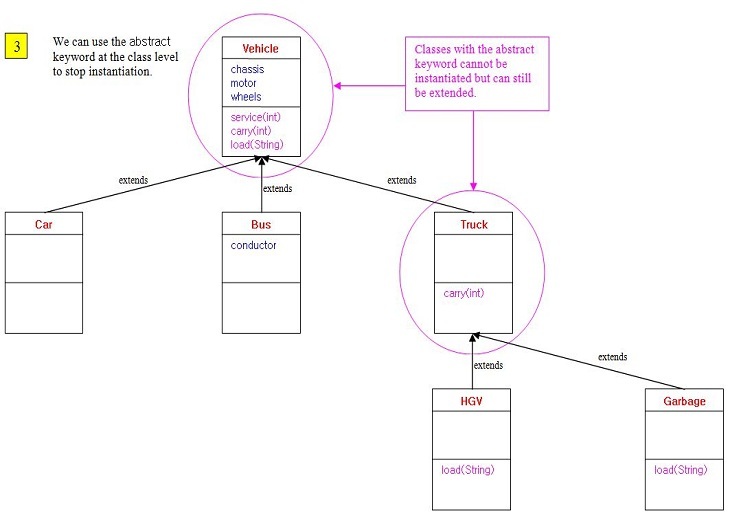 In our class inheritance tree for Vehicle Town we need to stop instantiation of the Vehicle and Truck class, as these are abstractions for their subclasses. To do this we use the abstract keyword in the class definition. This means that only static members of this class can ever be used unless we create a non-abstract subclass. So abstract classes need to be extended if we want to use any non-static members within the class. This also means that you can't declare a class as both abstract and final or the compiler complains. Non-abstract classes are known as concrete classes. Lets make our Vehicle class abstract. 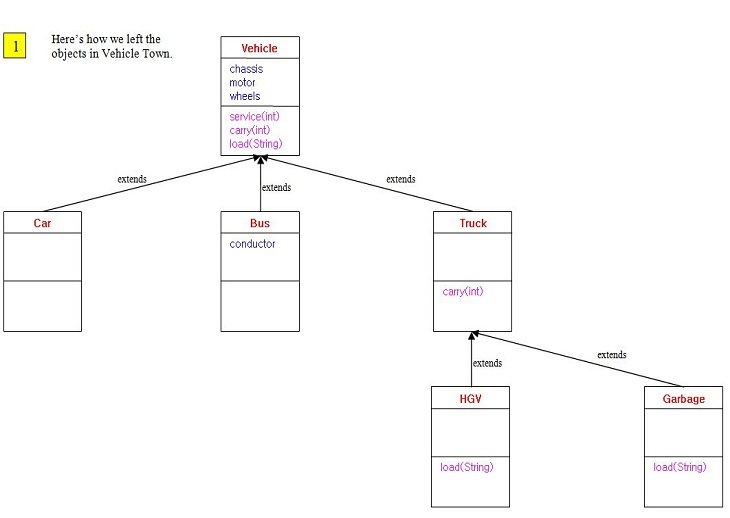 Save and compile our Vehicle class in directory c:\_OOConcepts in the usual way. We already have a TestVehicle class we coded earlier so lets rerun this. The above screenshot shows the output of testing our abstracted Vehicle class. The compiler won't allow us to instantiate the Vehicle class which is exactly what we want. Time to make our Truck class abstract as well. Save and compile our Truck class in directory c:\_OOConcepts in the usual way. We already have a TestTruck class we coded earlier so lets rerun this. 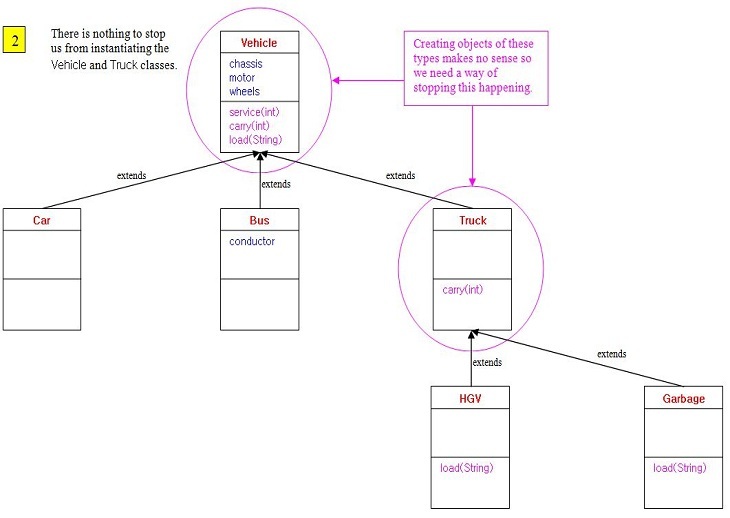 The above screenshot shows the output of testing our abstracted Truck class. The compiler won't allow us to instantiate the Truck class which is exactly what we want. We can also mark methods as abstract and if we do so the class must also be marked as abstract, as we can't have any abstraction in a concrete class. Whereas an abstract class must be extended in a subclass, an abstract method must be implemented in the first concrete subclass. This provides a contract that the compiler makes sure is met in the first concrete subclass. But why is this useful to us? Well it ensures that the first concrete subclass keeps to the contract by implementing any abstract methods of the superclass. To get to grips with this we need an example. We will code a new Truck subclass called Tanker. Save and compile our Tanker subclass in directory c:\_OOConcepts in the usual way. Save, compile and run the file in directory c:\_OOConcepts in the usual way. Well the code for our abstract load() method certainly looks different! Abstract methods have no body and are terminated by a semicolon. We should rerun a subclass test to make sure everything is still hunky dory. So recompile Classes HGV and TestHGV and run the latter just to make sure everything still works:. As you can see from the screenshot we get a compiler error because we didn't implement the abstract load() method from the Truck superclass. Now we are assured that any concrete subclass of the Truck class implements the abstract load() method. In this lesson we continued our investigation of OO concepts by looking at abstraction. We continue our investigation of OO concepts by learning about polymorphism.